ExpertGPS (formerly GeoBuddy) is geocaching software, written especially for geocachers who want to end every geocache hunt with a smile on their face and a Found It! in their logs. Unlike other geocaching utilities, ExpertGPS is a complete geocaching solution. ExpertGPS displays all of the geocaches in your area, as well as your own personal GPS data, over USGS topo maps, aerial photos, and your own scanned paper trail and road maps. 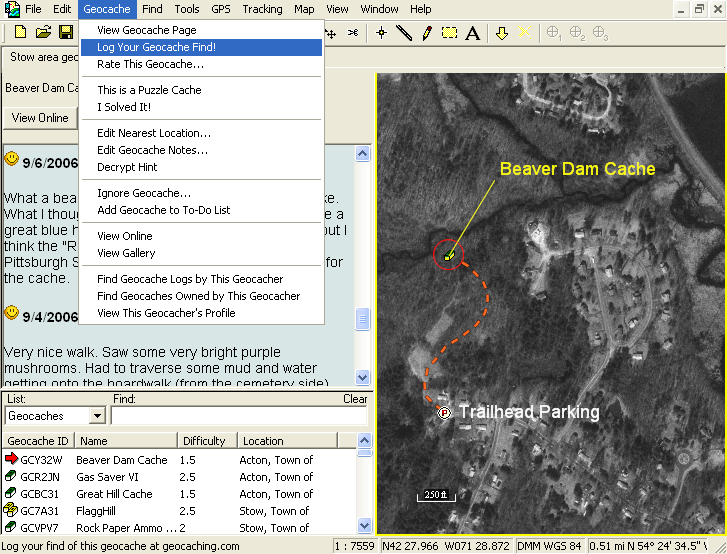 A built-in Web browser lists all of the information about each geocache, including pictures and hints left by the cache owner, and logs by recent visitors to the geocache. No other software gives you the maps, tools, and resources you need in one easy-to-use, integrated, package. ExpertGPS supports all Garmin, Magellan, Lowrance, and Eagle handheld GPS receivers. There's no need to key in geocache coordinates by hand - ExpertGPS can send hundreds of geocaches to your GPS in a matter of seconds. You can send geocaches, along with routes to guide you from the parking lot to the final cache location, to your GPS. After you return home, ExpertGPS will display the tracklog from your day's hike over the map, and allow you to log all the geocaches you found. ExpertGPS uses your Internet connection to retrieve topo maps and aerial photos of each geocache location, saving the maps to your hard drive. You can pan the maps around and zoom in close to find the best locations to park, and to identify obstacles (marshes, streams) between you and the geocache. If you own a laptop, you can even use ExpertGPS as a moving-map display in your car, showing your position in real-time on the map as you approach.